Patch on left courtesy of Jack Treutle (of blessed memory). 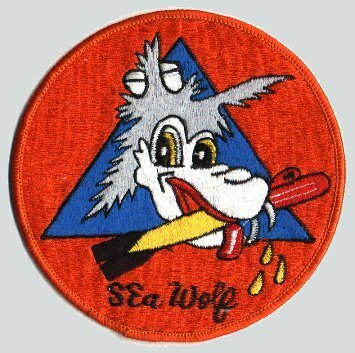 Other patches contributed by Mike Smolinski. Patch on right courtesy of Darry L. Baker. 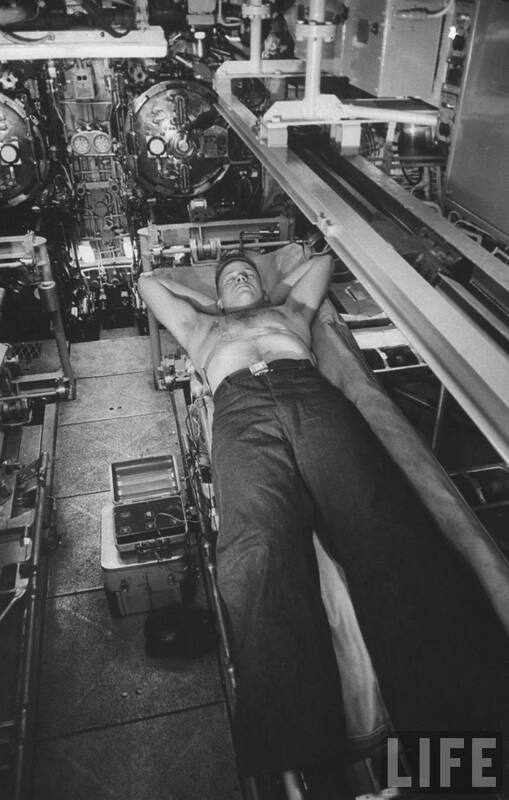 Seawolf Class Submarine: Laid down, 7 September 1953, at General Dynamics Corp. Electric Boat Co. 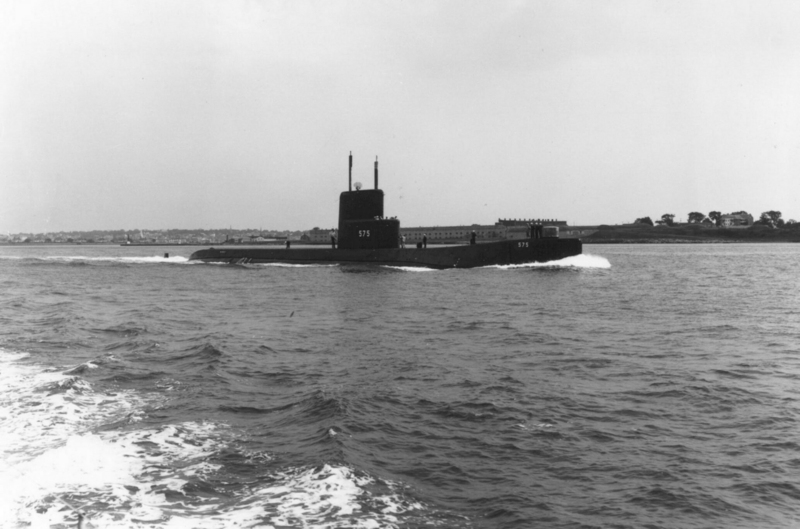 Div., Groton, CT.; Launched, 21 July 1955; Commissioned, USS Seawolf (SSN-575), 30 March 1957; Decommissioned, 12 December 1958; Recommissioned, 30 September 1960, at Groton, CT.; Decommissioned, 30 March 1987; Struck from the Naval Register, 10 July 1987; Final Disposition, disposed through NPSSRP (Nuclear Powered Ship and Submarine Recycling Program) at Puget Sound Naval Shipyard, Bremerton, WA., 30 September 1997. 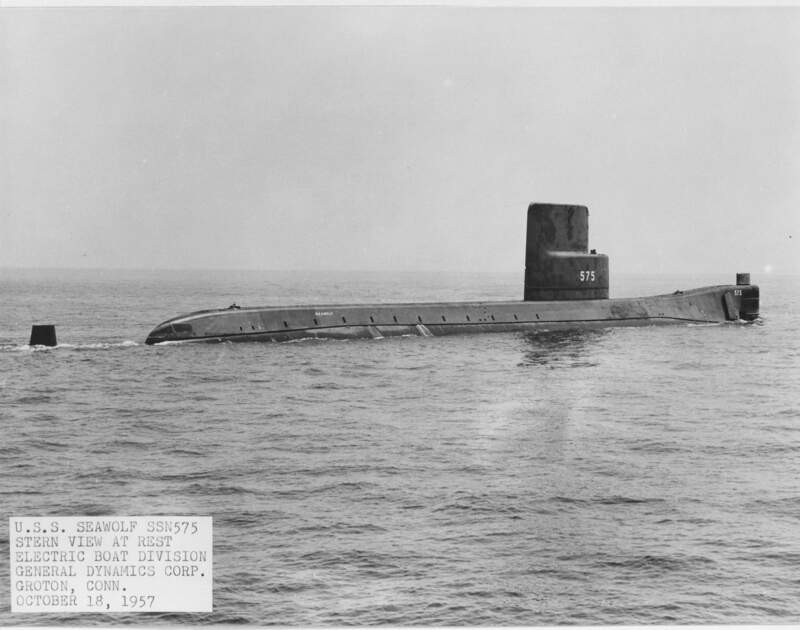 Specifications: Displacement, Surfaced: 3,260 t., Submerged: 4,110 t.; Length 338'; Beam 28'; Draft 23'; Speed, Surfaced 23 kts, Submerged 19 kts; Complement 101; Armament, six 21" torpedo tubes, Propulsion, sodium cooled nuclear reactor converted in a pressurized water cooled reactor, 1958-60, Twin-Screw Twin Steam Turbine. (C/o John Parrott MM1/SS). 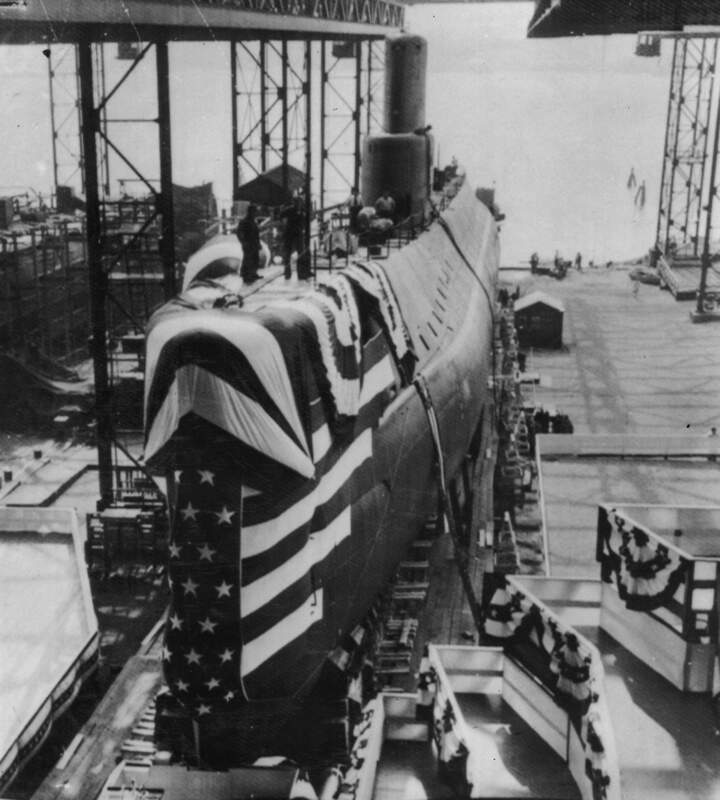 671k Nautilus (SSN-571) is decked out in her ceremonial bunting on the ways, awaiting the arrival of the Ship's Sponsor. 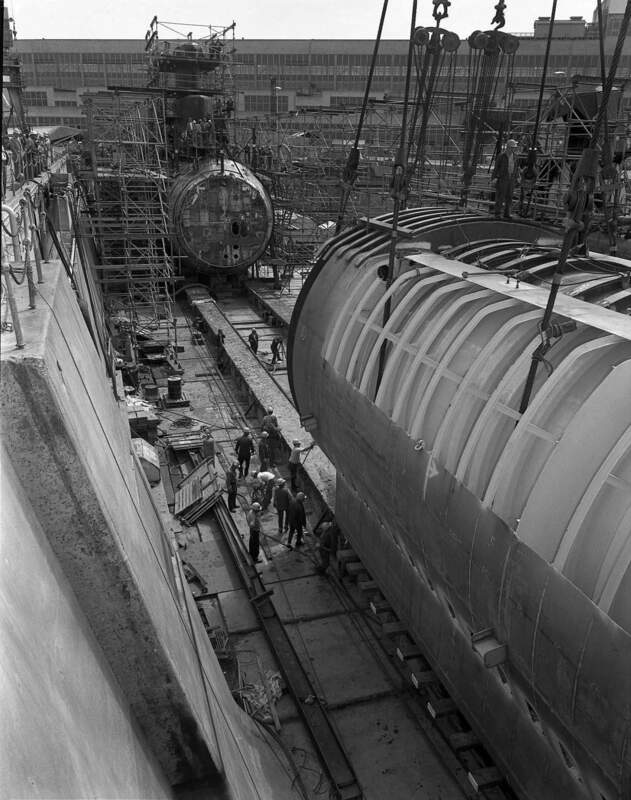 The Seawolf (SSN-575) is under construction on the next way. Photo courtesy of navy.mil. 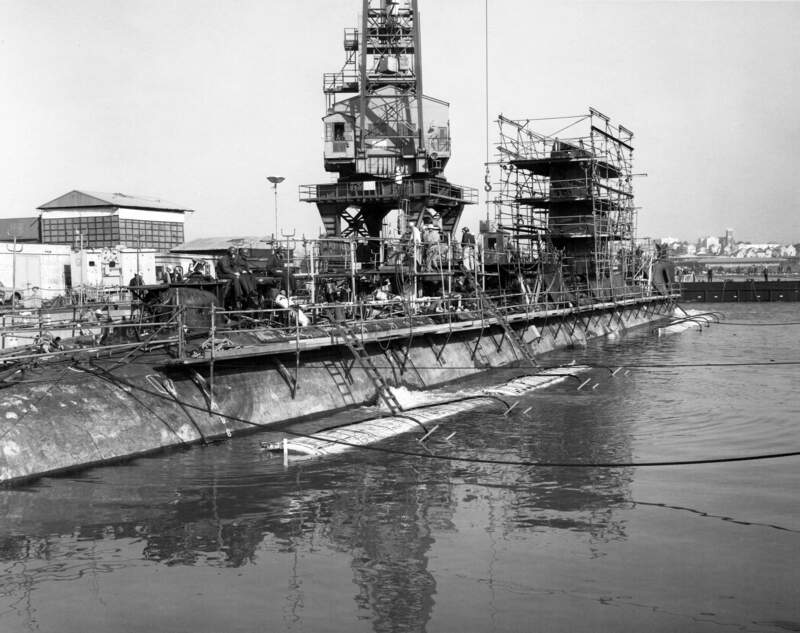 109k Twin billing: Nautilus (SSN-571) ready for launch & Seawolf (SSN-575) under construction on 21 January 1954. Photo courtesy of vendio.com via Ron Reeves (of blessed memory). 891k (Original Caption) The conning tower of the Navy's new nuclear-powered submarine, the Seawolf (SSN-575), gets her new number - 575 - in preparation for her launching in mid-July. 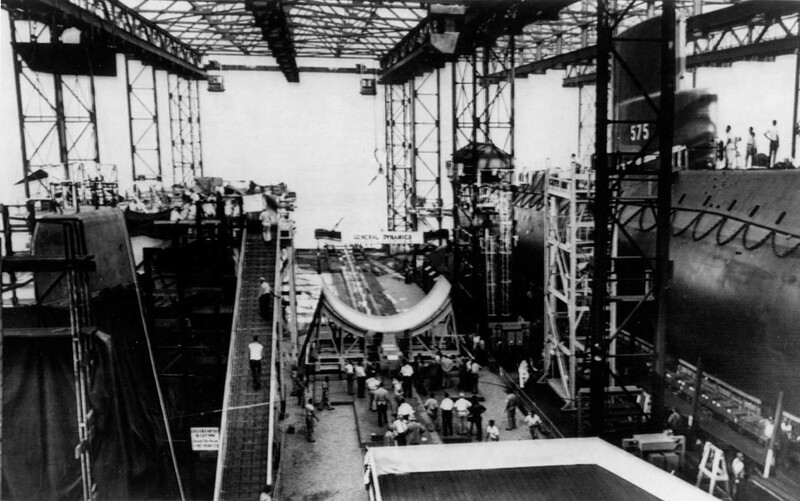 She is under construction on the shipways at the yard here of the electric boat division of General Dynamics Corporation next to where the first A-sub, the Nautilus (SSN-571), was launched nearly 16 months ago. 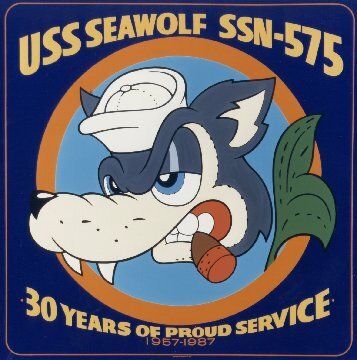 This is the first photo of the Seawolf to be cleared by the Navy for general release. 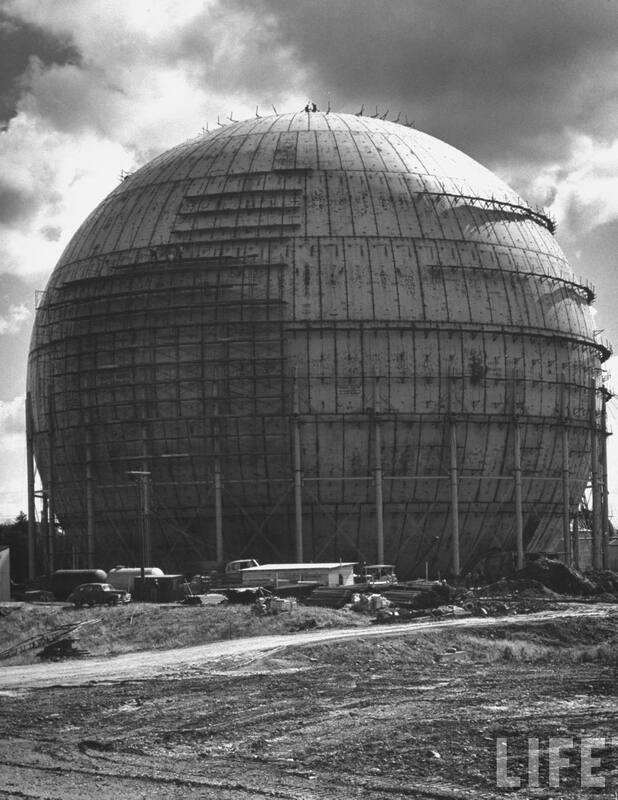 Photo Bettmann Collection/Getty Images, courtesy of gettyimages.com. 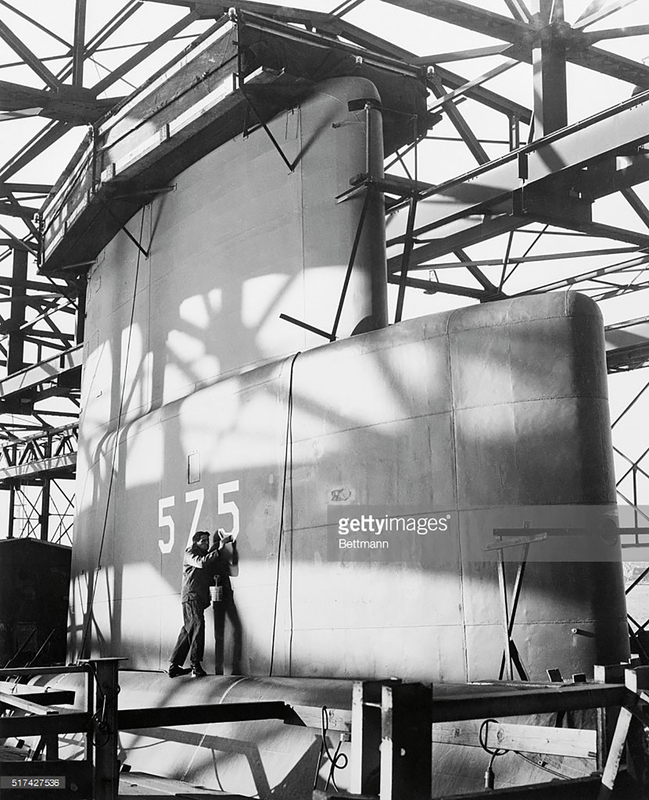 233k Seawolf (SSN-575) getting ready for launching, 21 July 1955, at General Dynamcs, Electric Boat Div. Groton, CT. Photo courtesy of life.time.com via Bill Gonyo. 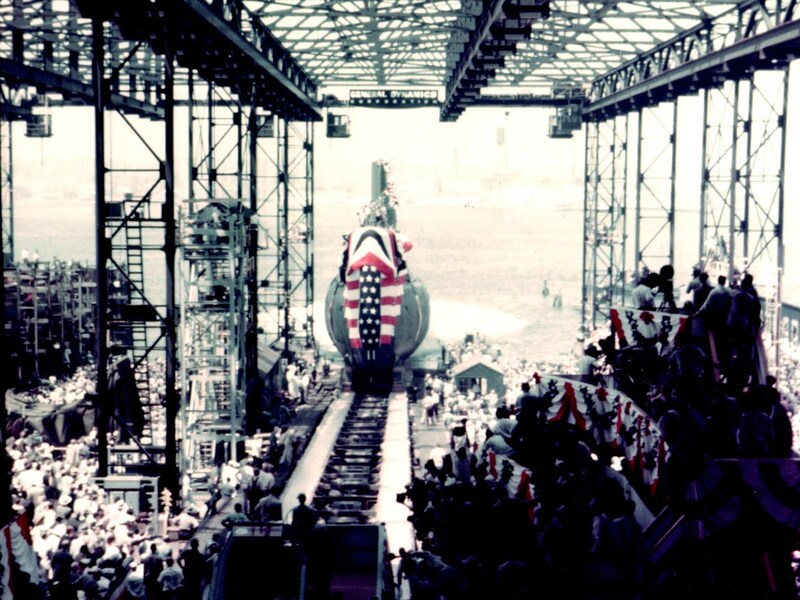 119k Attempt to christen the Seawolf (SSN-575). 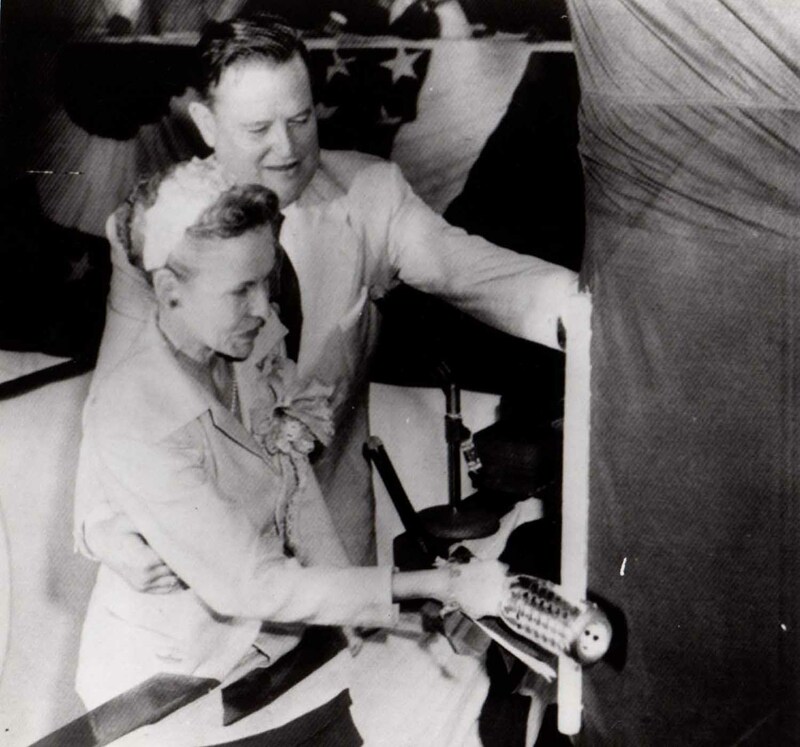 The press caption read: "Mrs. W. Sterling Cole, wife of the congressman from New York, wields the bottle of champagne as she christens the atomic submarine Seawolf today. She failed to break the bottle and it slipped out of her hand." Photo courtesy of Dale Hargrave. 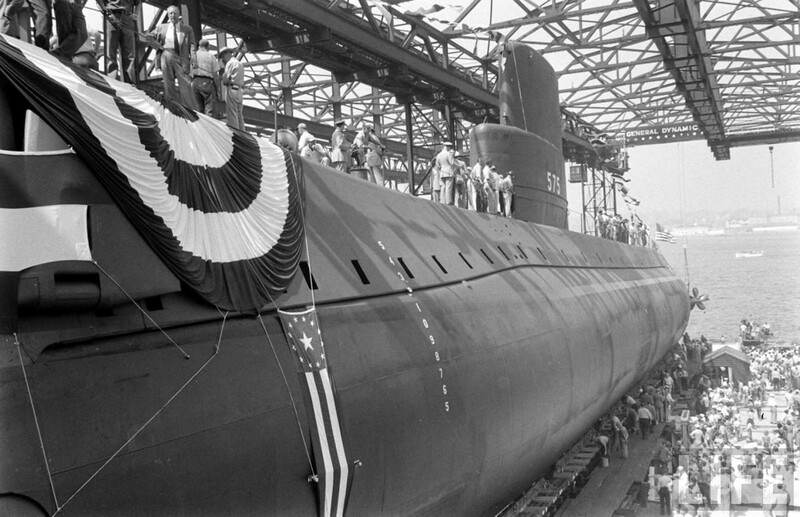 441k The Seawolf (SSN-575) ready for launching at Electric Boat on 21 July 1955. USN photo courtesy of Vallejo Naval and Museum via Darryl L. Baker. 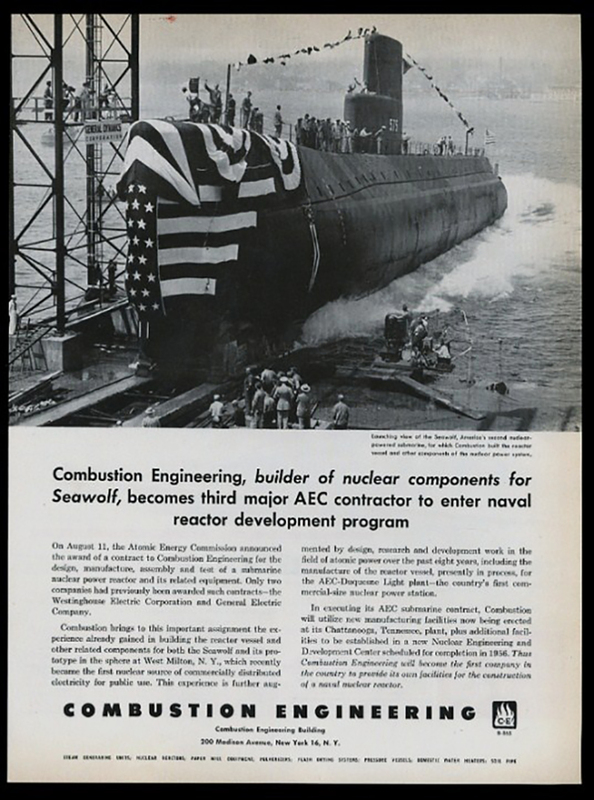 1.22k Four views of the same: Seawolf (SSN-575) in black & white, launching post card, & an advertisement by Combustion Engineering , 21 July 1955, at General Dynamcs, Electric Boat Div. Groton, CT. Black & white photo courtesy of R.M. Wagner. Postcard image 06_10_004124 via The Tichnor Brothers Collection, Boston Public Library & digitalcommonwealth.org. Color insert courtesy of Scott Koen & ussnewyork.com. Ad insert courtesy of Tommy Trampp. 235k Seawolf about to touch water. Photo courtesy of Dale Hargrave. 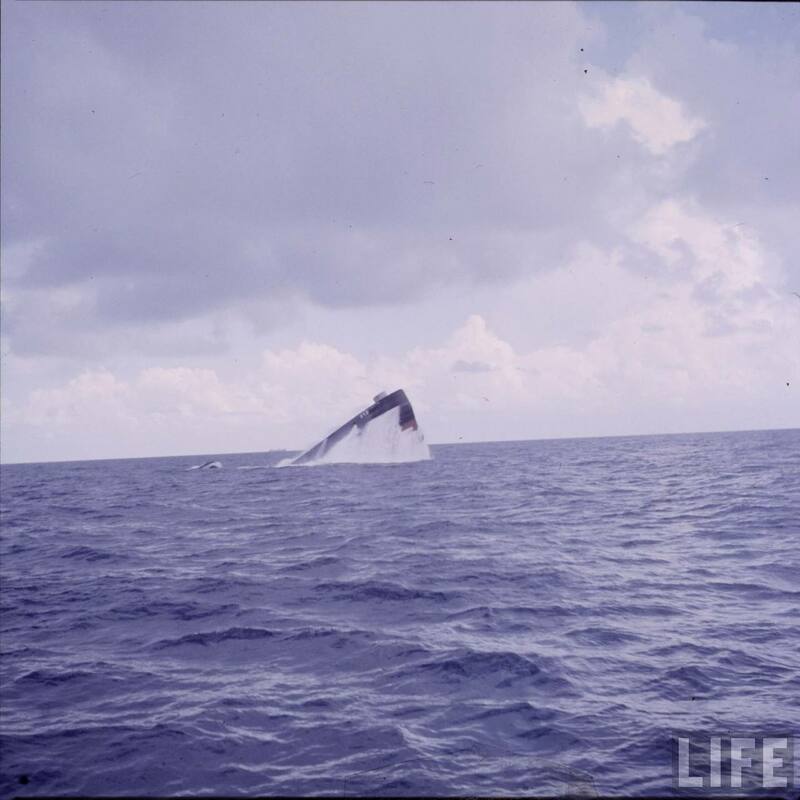 145k Seawolf (SSN-575) at the end of her slide. Photo courtesy of Dale Hargrave. 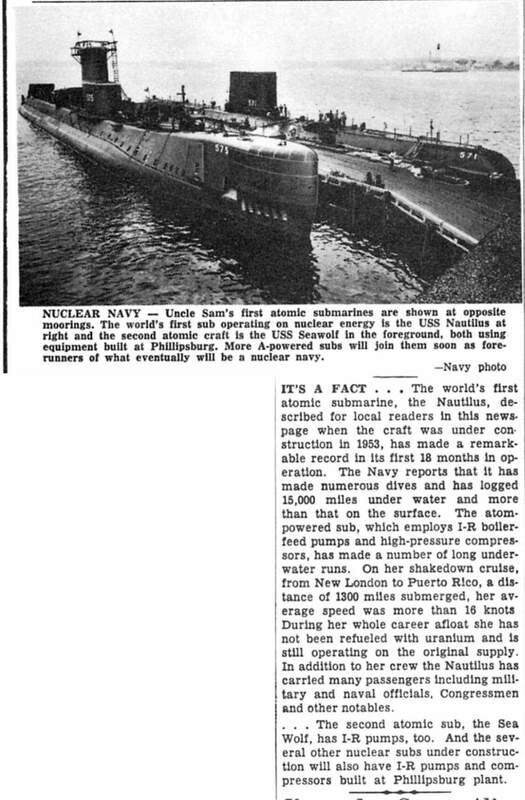 193k Seawolf (SSN-575) undergoing some TLC alongside Nautilus (SSN-571) at Groton appear together in an Ingersol-Rand Company newsbrief dated 5 June 1956. Insert courtesy of Ron Titus. USN photo courtesy of town.groton.ct. 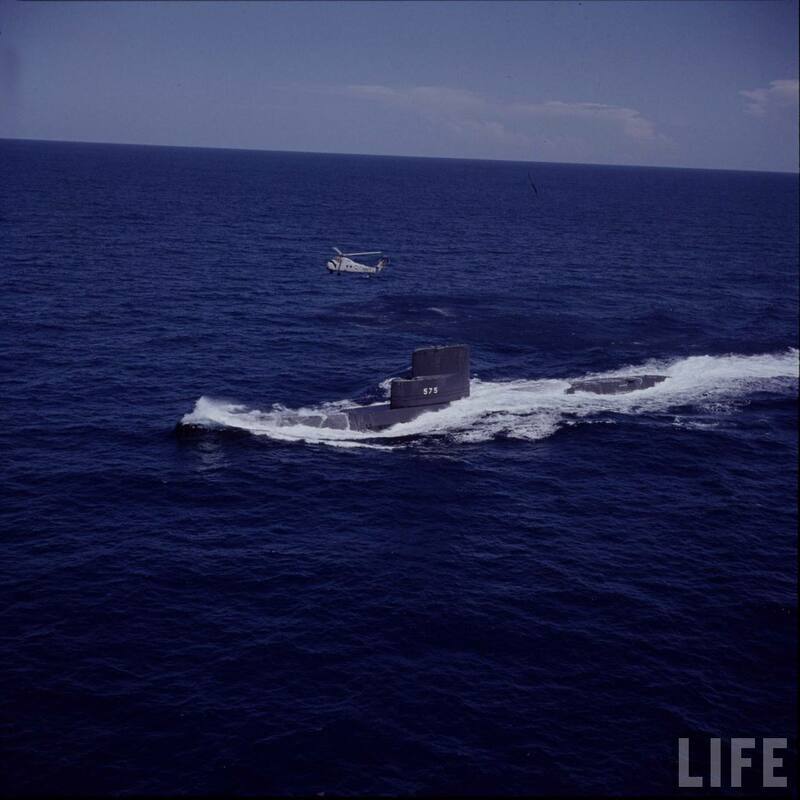 28k Seawolf (SSN-575) and Nautilus (SSN-571) appear together, circa 5 June 1956. 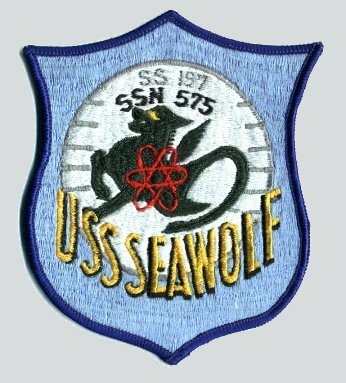 Between 16 May and 5 August 1956, Seawolf made two voyages to Key West and participated in intensive training exercises. Photo from Conway's All The World's Fighting Ships 1947-1995 and submitted courtesy of Robert Hurst. 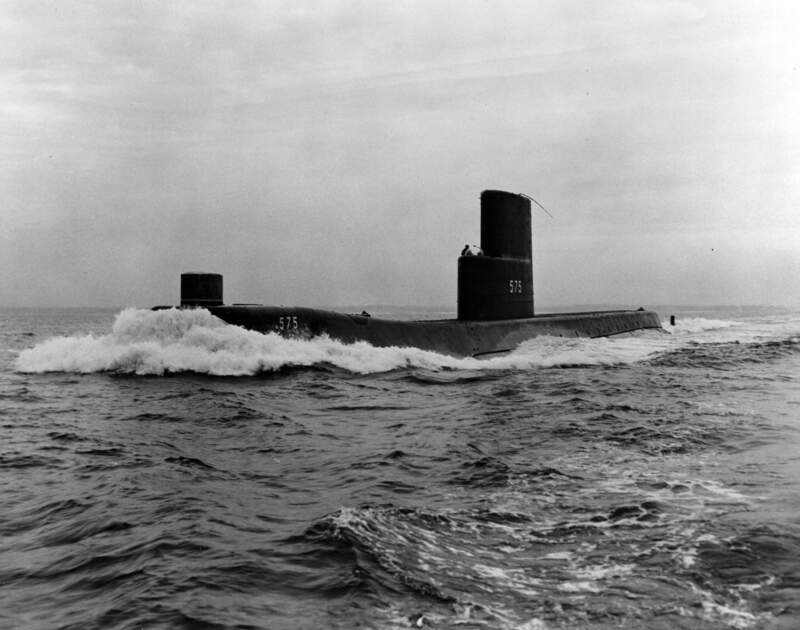 864k Seawolf (SSN-575) on sea trials off New London, Conn. on 28 February 1957. USN photo # 1008338-2-57 TH courtesy of the Vallejo Naval & Historical Museum via Darryl L. Baker. 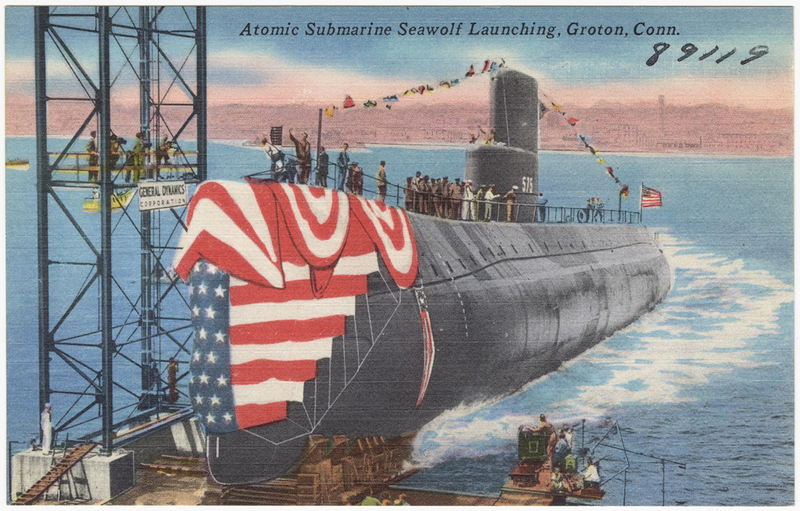 The first three ships in the Nuclear Navy: Nautilus (SSN-571), Seawolf (SSN-575), and Skate (SSN-578), are shown together for the first time at General Dynamic Corporation's Electric Boat Division in Groton, Connecticut, where they were built. 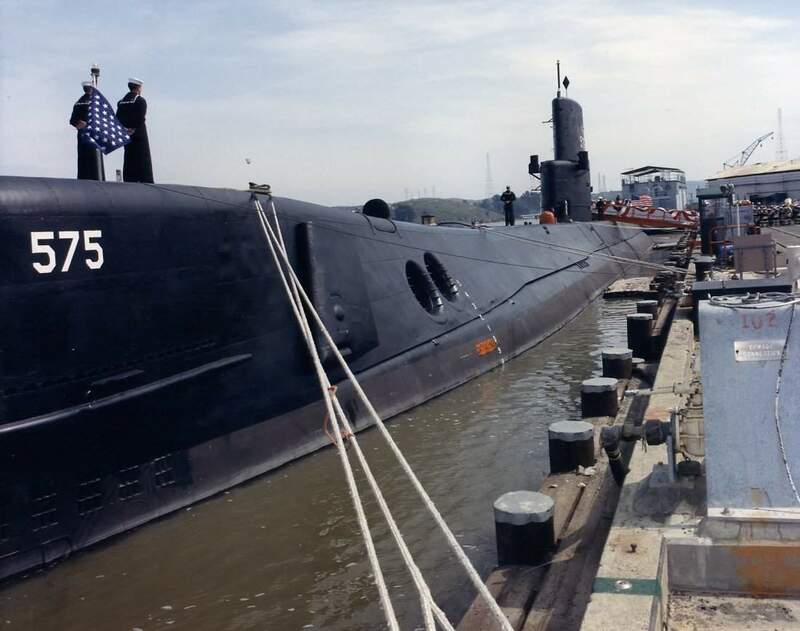 The Seawolf and Nautilus returned to their birthplace for a brief upkeep period while Skate, launched 16 May is being readied for builder's trials. Sixteen additional atomic submarines have been ordered by the Navy. Nautilus departed 19 August to participate in NATO Exercises. 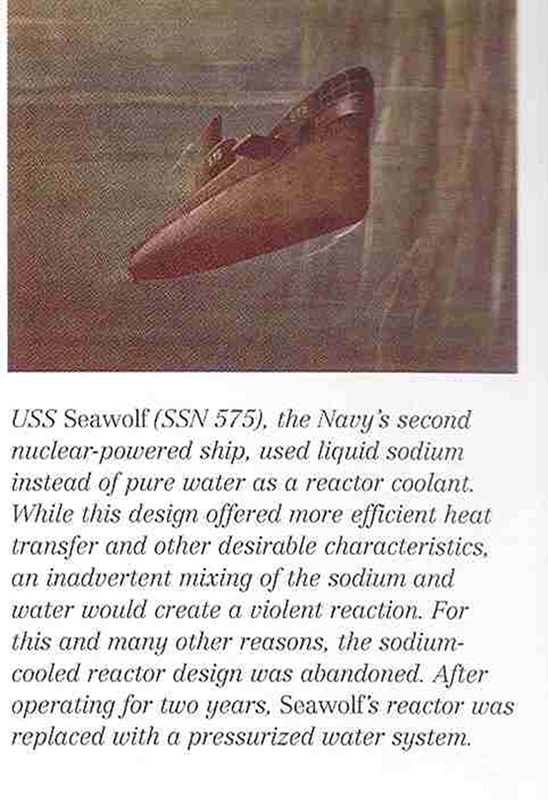 Photo # USN 709933, courtesy of the National Museum of the U.S. Navy, via flickr.com. 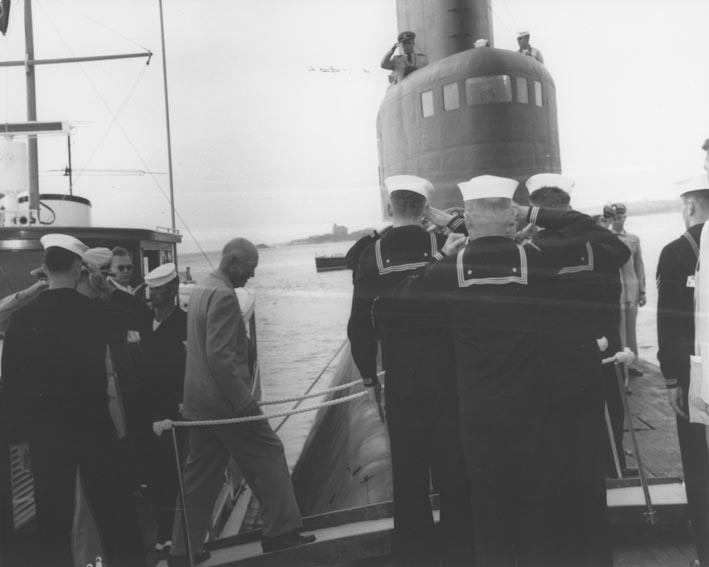 36k President Dwight D. Eisenhower going aboard the atomic-powered submarine Seawolf (SSN-575) from the presidential yacht Barbara Anne off Newport, RI, 26 September 1957. 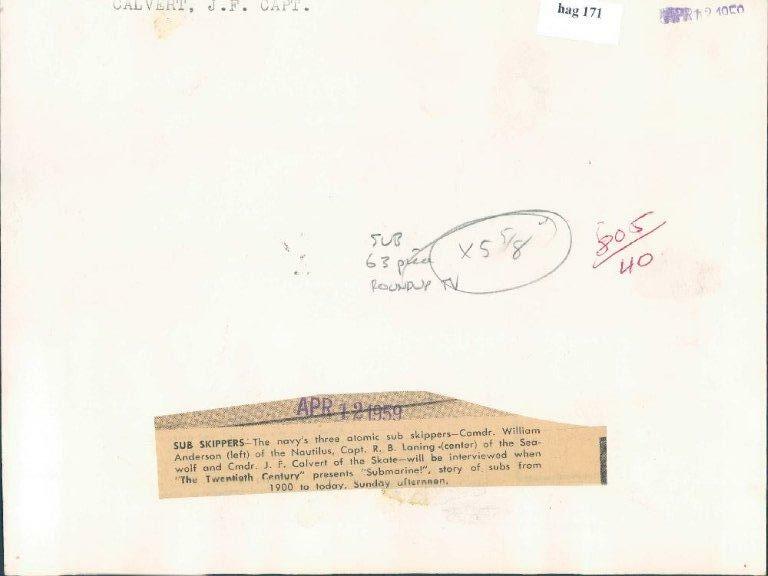 Copy of Naval Historical Center Image # NH 68559 in former Navy files now in the collection of the National Archives, San Francisco Branch" & submitted by Tracy White @ Researcher @ Large. 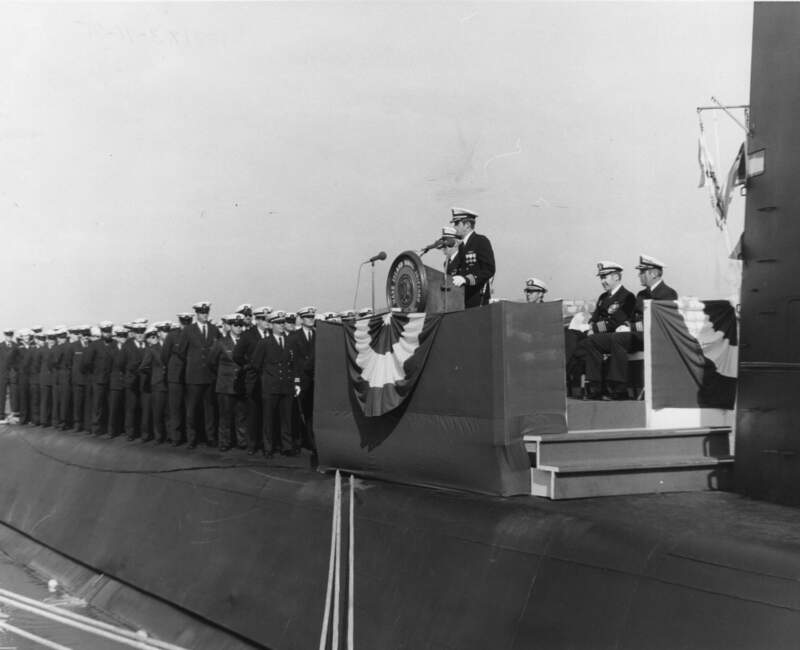 55k President Dwight D. Eisenhower aboard the atomic-powered submarine Seawolf (SSN-575) off Newport, RI, 26 September 1957. Here the President eats with the crew. On the president's left is Milton W. Tucker, partly hidden, is James Hagerty, presidential press secretary. Across from the president is W.J. 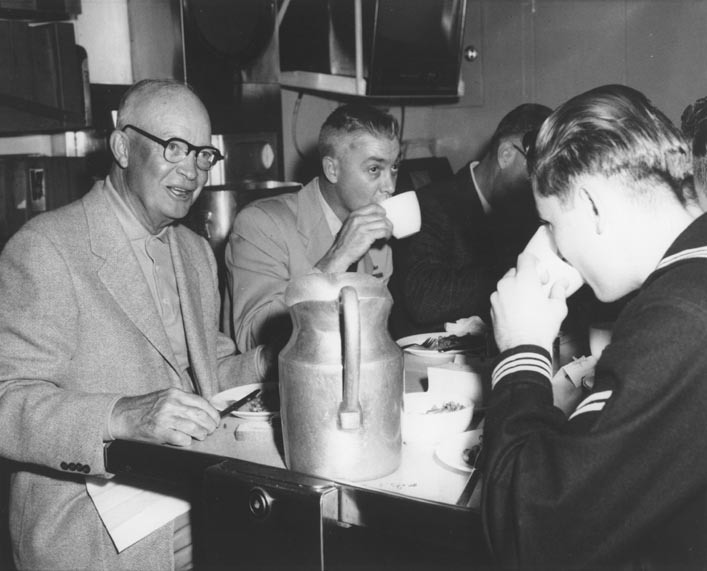 Dooling, SA, USN, (drinking coffee), who is the youngest man in the crew. 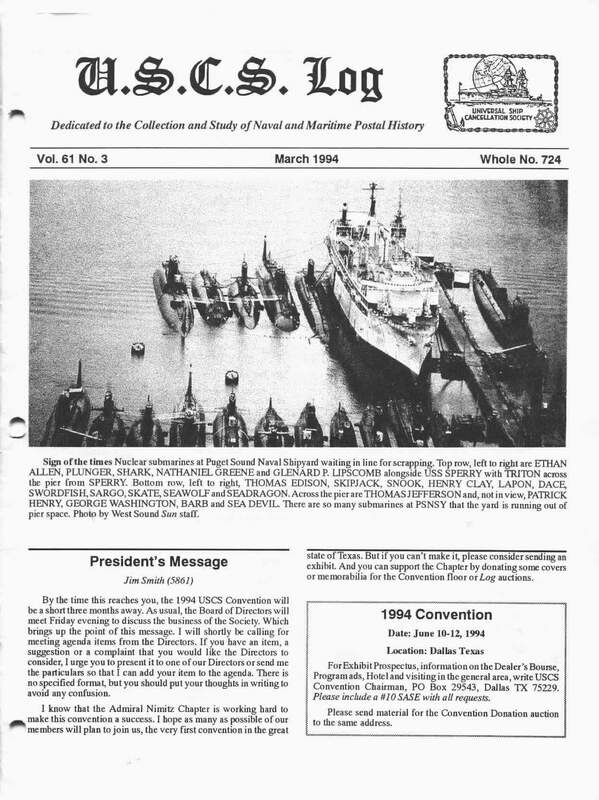 Copy of Naval Historical Center Image # NH 68560 in former Navy files now in the collection of the National Archives, San Francisco Branch" & submitted by Tracy White@ Researcher @ Large. 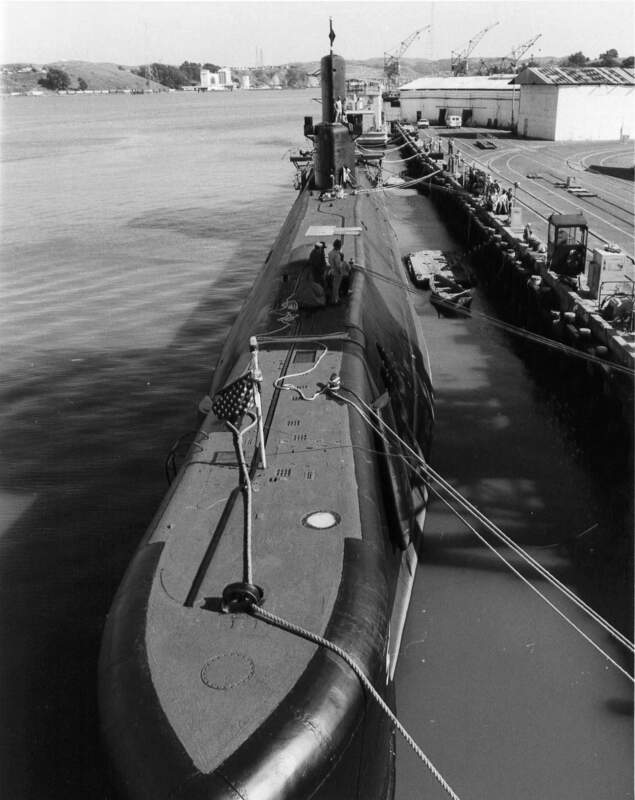 722k The Seawolf (SSN-575) stern view at rest, Electric Boat Division, General Dynamics Corp. Groton Conn. 18 October 1957. US National Archives photo # 80-G-1036013, from NARA, College Park, Maryland, courtesy of Sean Hert. 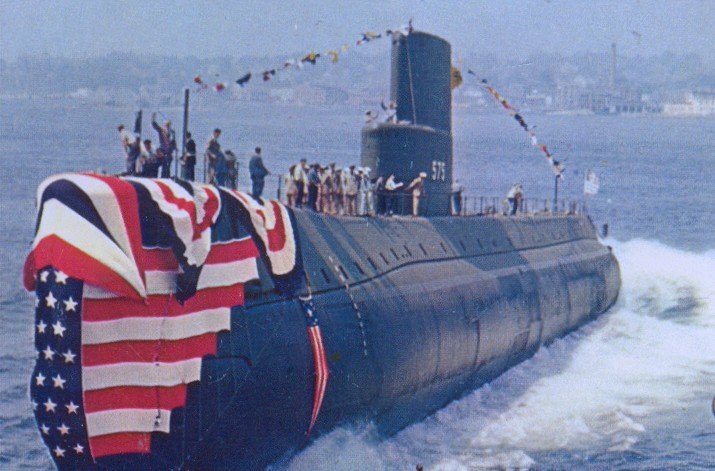 775k Ten photo PDF of Seawolf (SSN-575) during a series of test runs off Groton Conn. 18 October 1957. US National Archives photo # 80-G-103601, from NARA, College Park, Maryland, courtesy of Sean Hert. 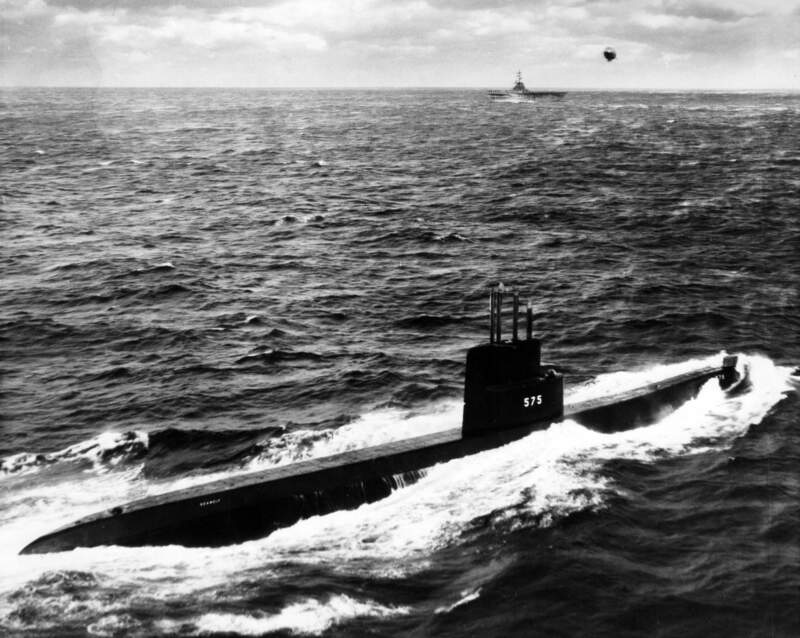 1.05k Seawolf (SSN-575) with Leyte (CVS-32) and ZPG-2 during an ASW exercise off the coast of Key West, FL in February 1958. USN photo # 1034051-2-58 TH courtesy of the Vallejo Naval & Historical Museum via Darryl L. Baker & John Hummel, USN (Retired). 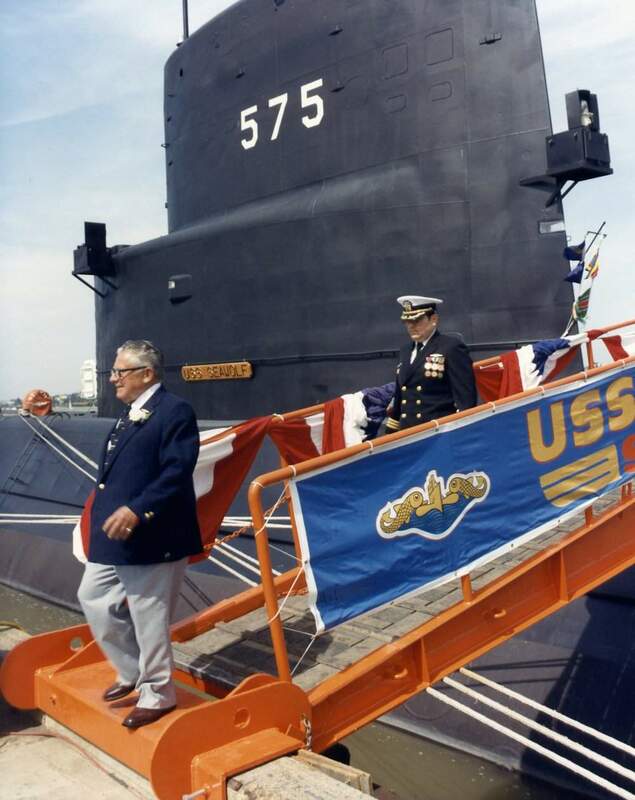 148k The "Submarine Seawolf (SSN-575) Emerges After 60 Days Below". 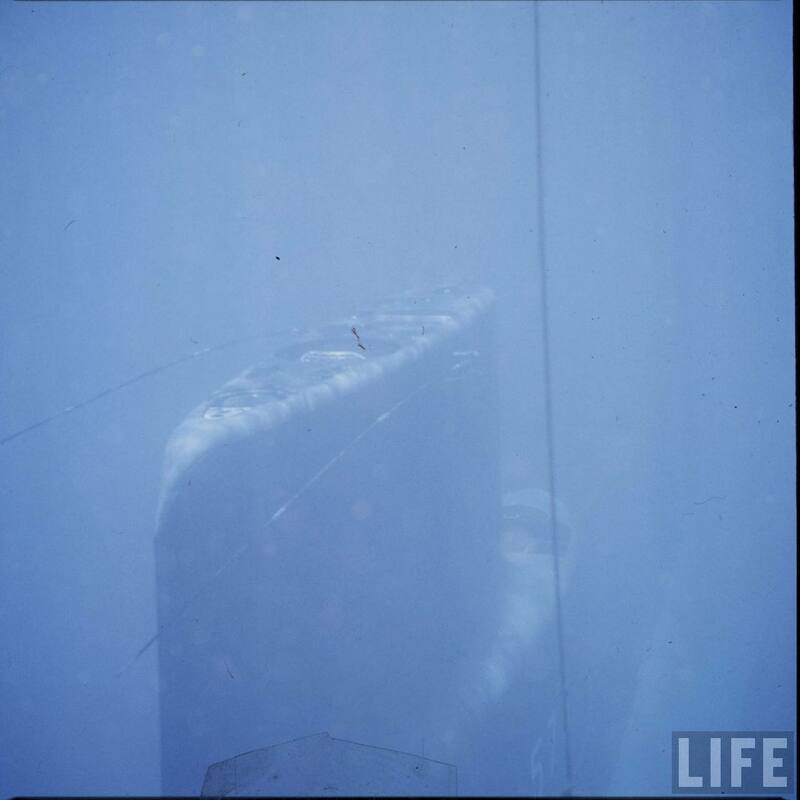 Seawolf submerged on 7 August 1958 and did not surface again until 6 October. 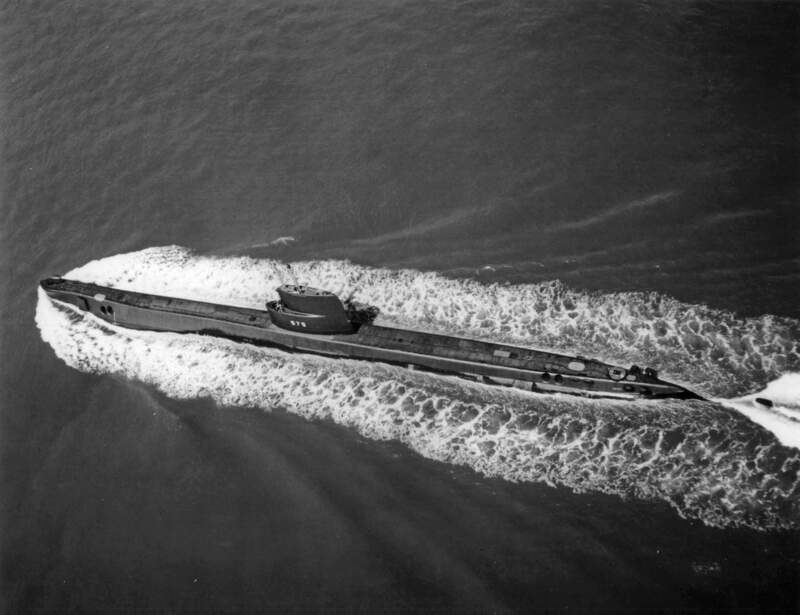 During this period, she logged over 13,700 nautical miles, demonstrating to the world the ability of the nuclear-powered submarine to remain independent of the earth's atmosphere for the period of a normal war patrol. Text courtesy of DANFS. Link courtesy of Darryl L. Baker. 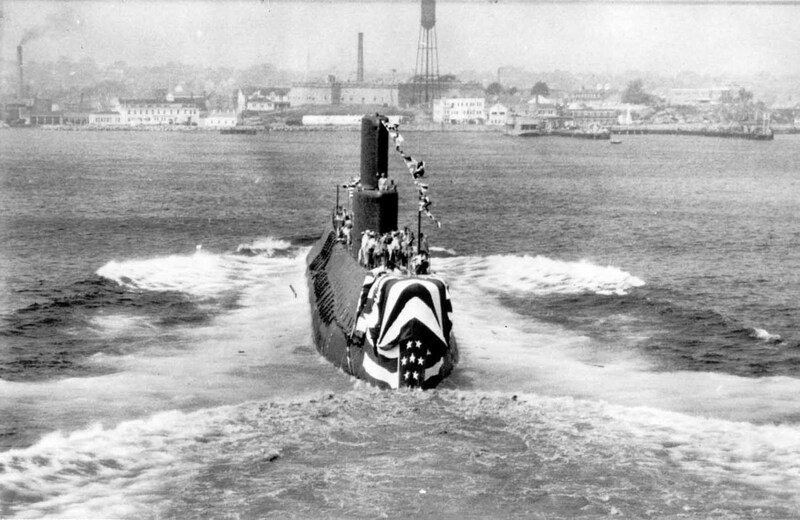 478k Seawolf (SSN-575) returns to New London, Ct. after her 60 day submerged cruise on 6 October 1958. Note hull damage on her port side under the sail. USN photo # 412X2-10-58 TH courtesy of the Vallejo Naval & Historical Museum via Darryl L. Baker. 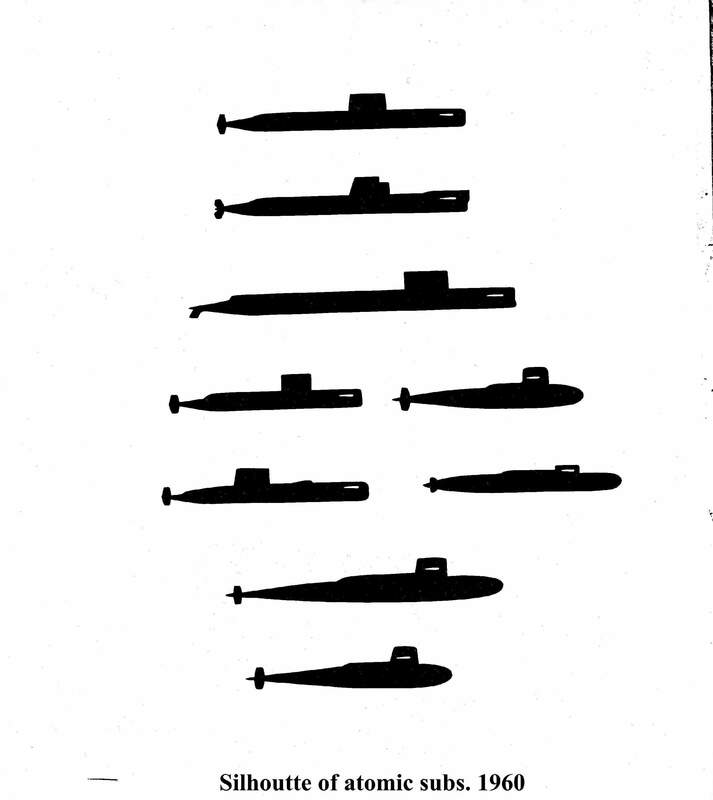 Nautilus (SSN-571), Seawolf (SSN-575), Skate (SSN-578), Skipjack (SS-585), Triton (SSRN-586), Halibut (SSGN-587) , Thresher (SSN-593), Tullibee (SSN-597), George Washington (SSBN-598), & Ethan Allen (SSBN-608) classes. USN photo submitted by Ron Titus, courtesy of Ingersoll-Rand. 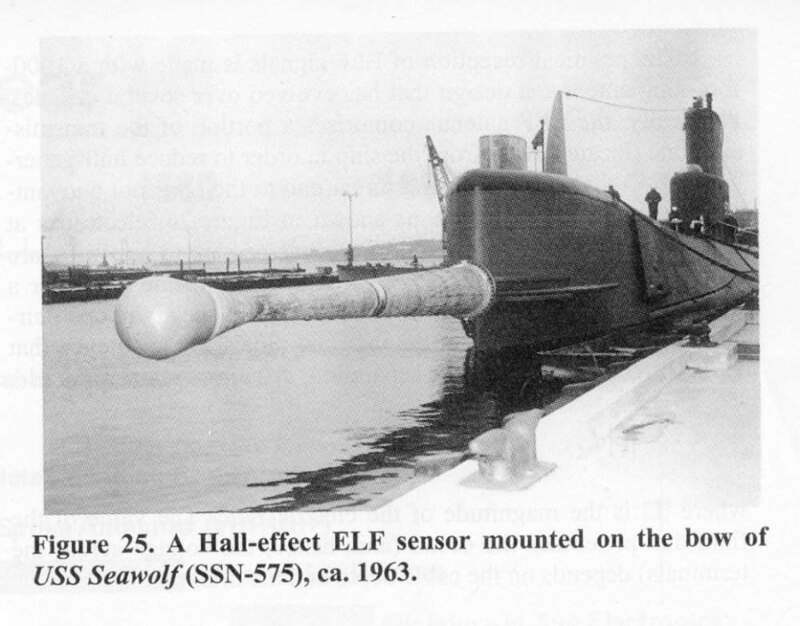 Corp.
84k Looking pretty much like a giant door stopper, this circa 1963 photo shows the Seawolf (SSN-575) with a Hall-effect ELF sensor mounted on her bow. From the IEEE Antennas and Propagation Magazine, Vol. 46, No. 1, February 2004. Submitted by Anton Karklit. 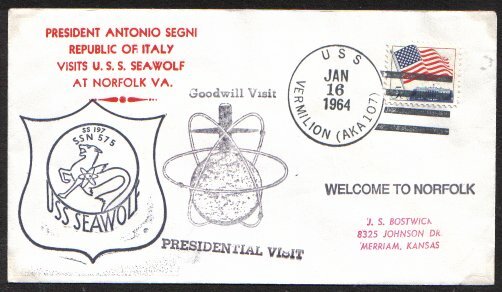 39k Commemorative post mark on the occasion of the President of Italy, the Honorable Antonio Segni visit on the Seawolf (SSN-575) at Norfolk VA, 16 January 1964. Courtesy of Jack Treutle (of blessed memory). 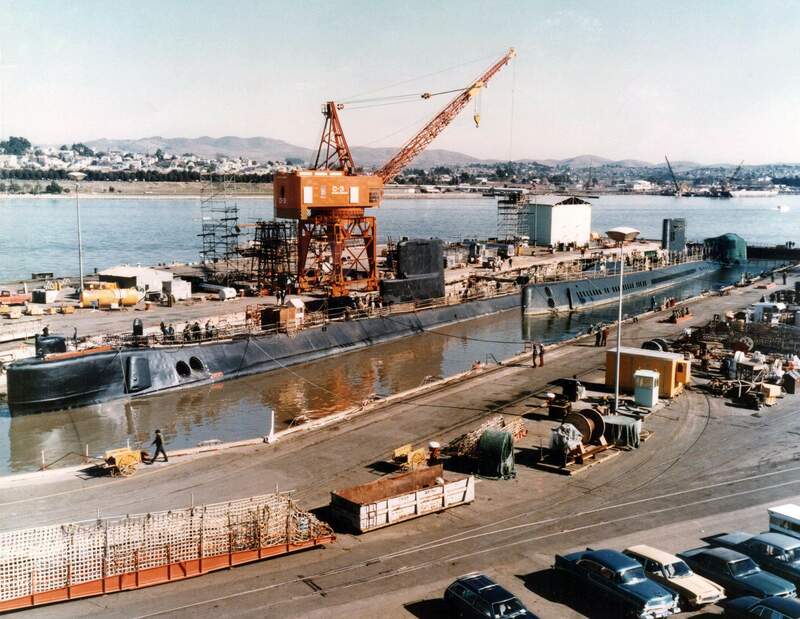 843k Seawolf (SSN-575) in Mare Island's dry dock #4 at the start of her conversion overhaul in February 1971. USN photo # 102473-2-71, courtesy of Vallejo Naval and Museum via Darryl L. Baker. 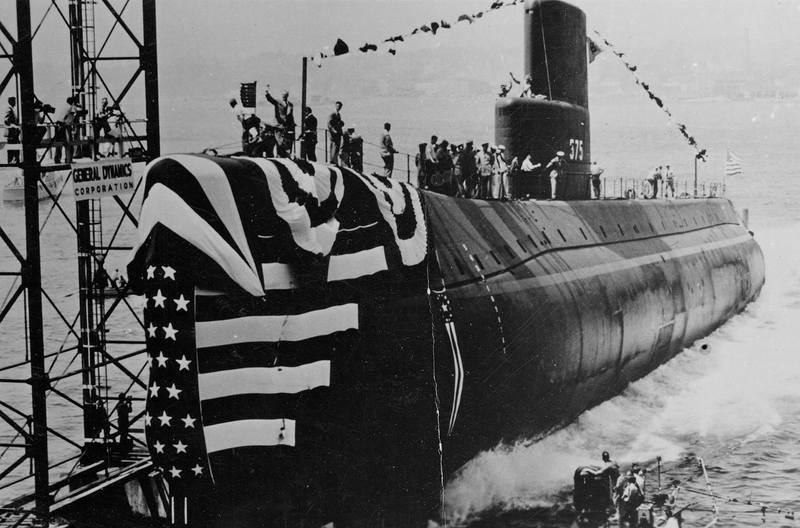 300k The Seawolf (SSN-575) is about to received her new "Special Projects" hull section at Mare Island on 2 June 1971. She is in dry dock #4. USN photo # 104570-6-71 courtesy of Darry L. Baker. 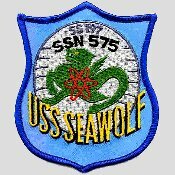 888k Seawolf (SSN-575) post 1973. 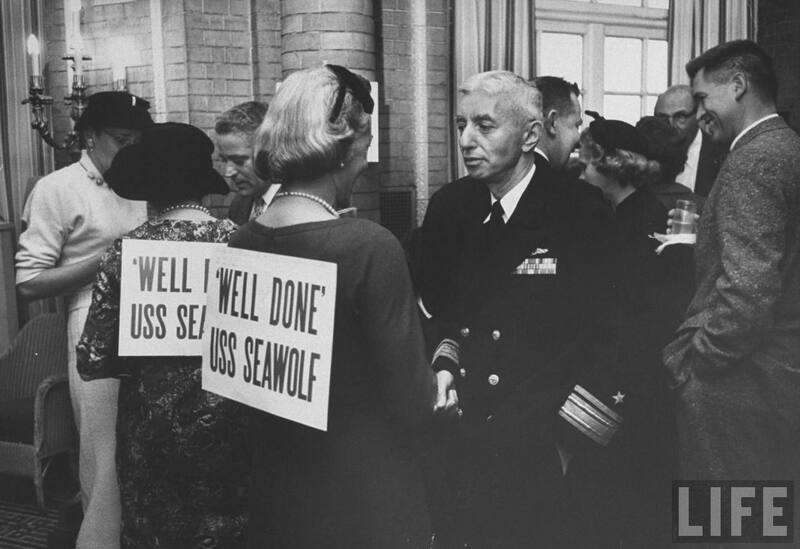 484k CDR John A. Webster (left) is relieved by CDR Charles R. MacVean as Commanding Officer of Seawolf (SSN-575) on 1 November 1975 at Mare Island, and makes his farewell. USN photo # 1331X1-11-75 TH courtesy of the Vallejo Naval & Historical Museum via Darryl L. Baker. 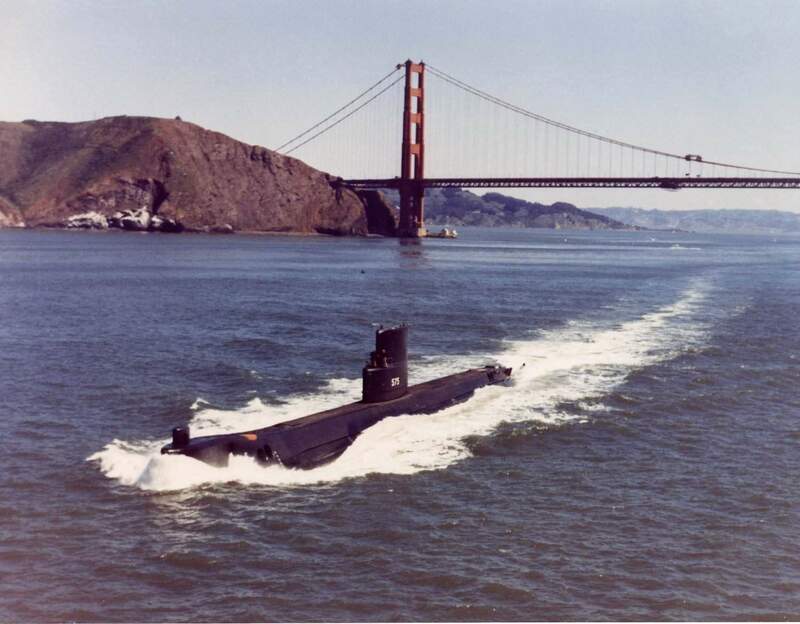 148k The Seawolf (SSN-575) is seen departing San Francisco Bay in August 1977. The Golden Gate Bridge is in the background. USN photo # KN-26095, courtesy of Darry L. Baker. 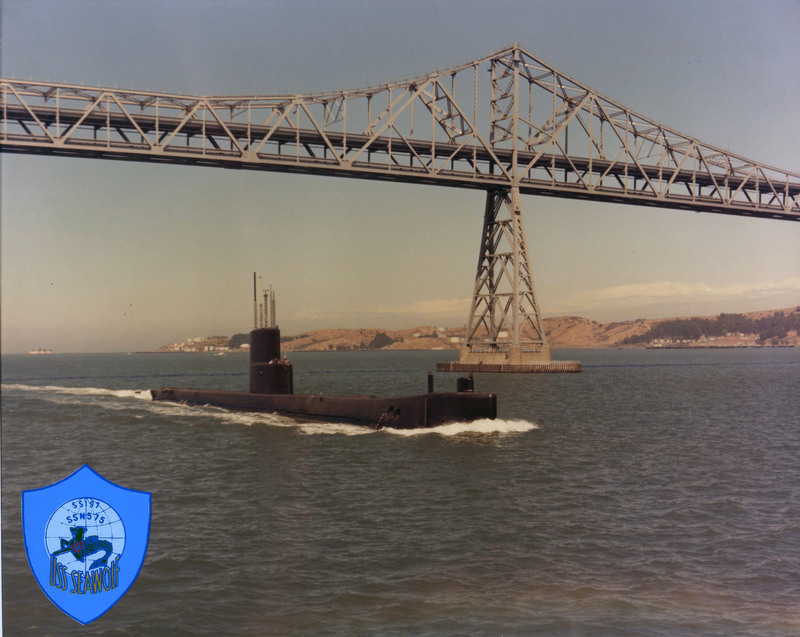 188k The Seawolf (SSN-575) is seen passing under the San Rafael - Oakland Bay Bridge during the 1980's. Photo courtesy of Jim Stats and submitted by Darryl L. Baker. 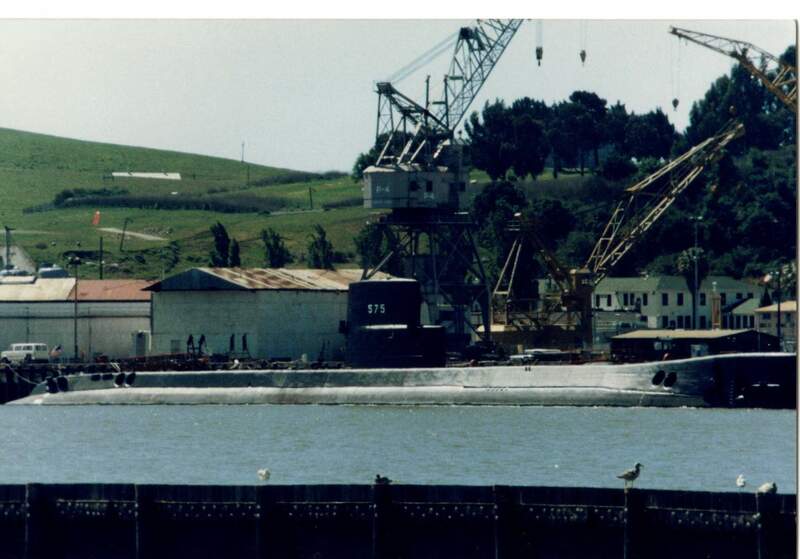 122k Seawolf (SSN-575) at Mare Island on 22 March 1984. USN photo # 201916-3-84, courtesy of Darry L. Baker. 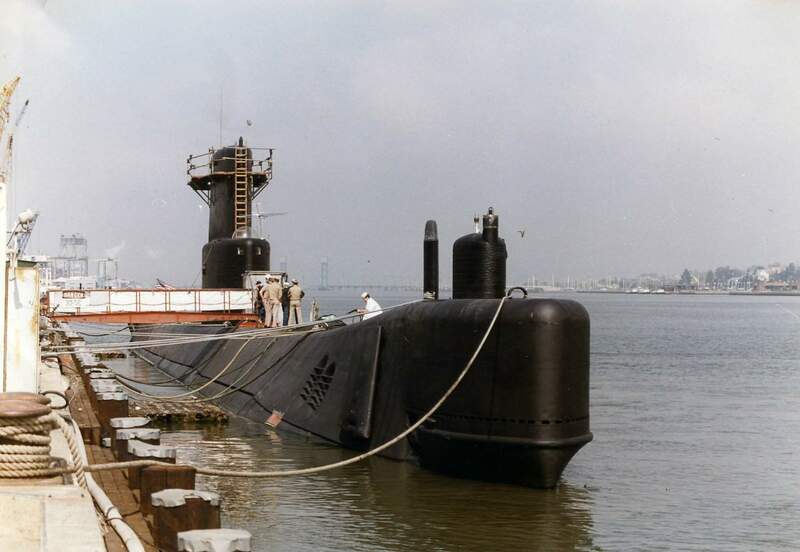 117k The Seawolf (SSN-575) at Pearl Harbor in 1985. USN photo courtesy of Darry L. Baker. 98k The Seawolf (SSN-575) berth at Pearl Harbor in April 1986. USN photo courtesy of Darry L. Baker. The aircraft carrier Enterprise (CVAN-65), guided missiles cruisers Long Beach (CGN-9) and Bainbridge (CGN-25) and Seawolf (SSN-575) pose for an all nuclear photo. USN Official photo courtesy of Robert Hurst. 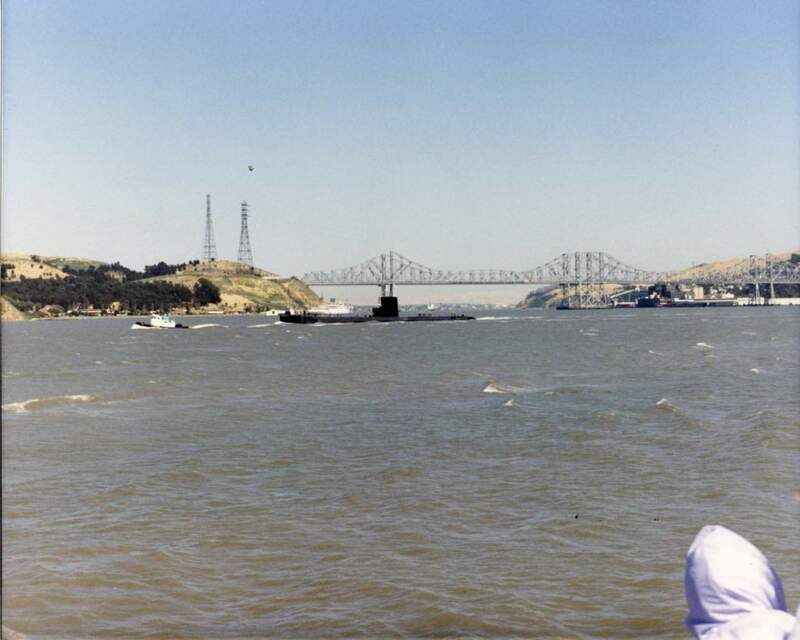 96k The Seawolf (SSN-575) about to enter Mare Island for the last time on 23 June 1986. USN photo courtesy of Darry L. Baker. 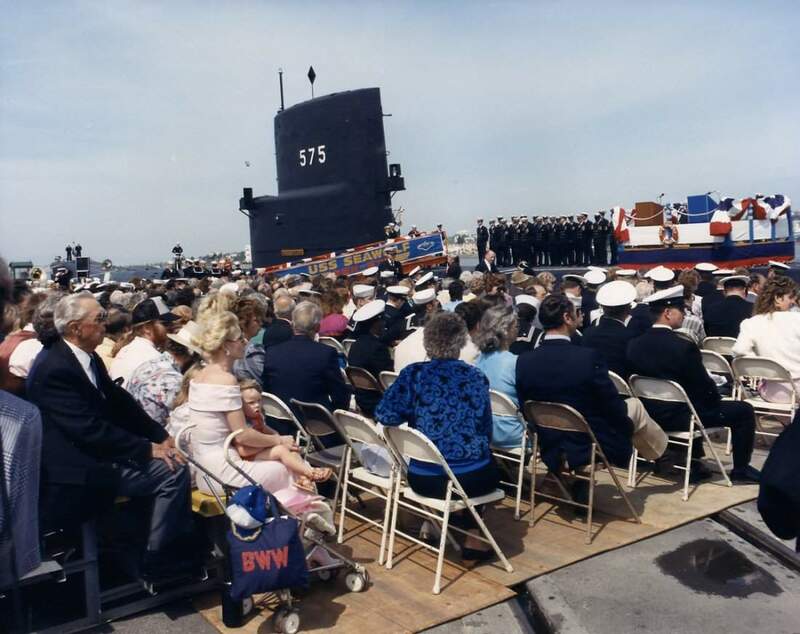 99k The decommissioning ceremonies are about to start for the Seawolf (SSN-575) at Mare Island on 30 March 1987. USN photo # 219975-3-87, courtesy of Darry L. Baker. 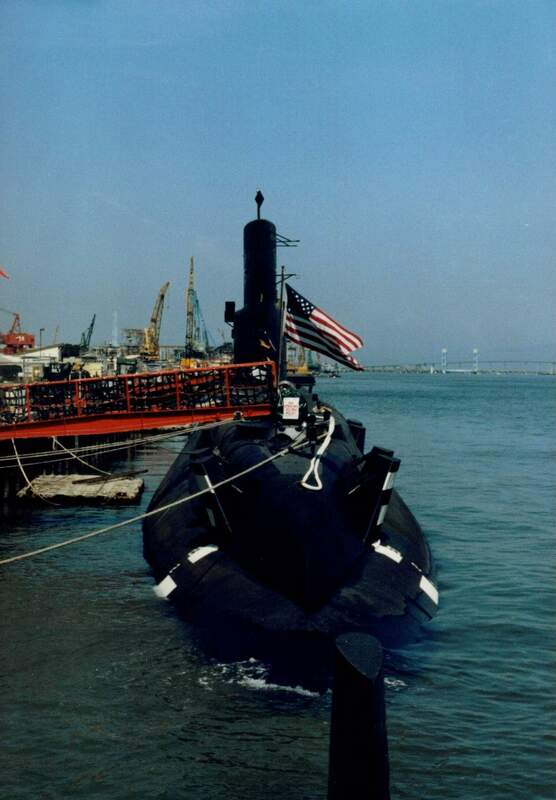 84k Bow view of the Seawolf (SSN-575) during her decommissioning cermonies at Mare Island on 30 March 1987. USN photo # 219985-3-87, courtesy of Darry L. Baker. 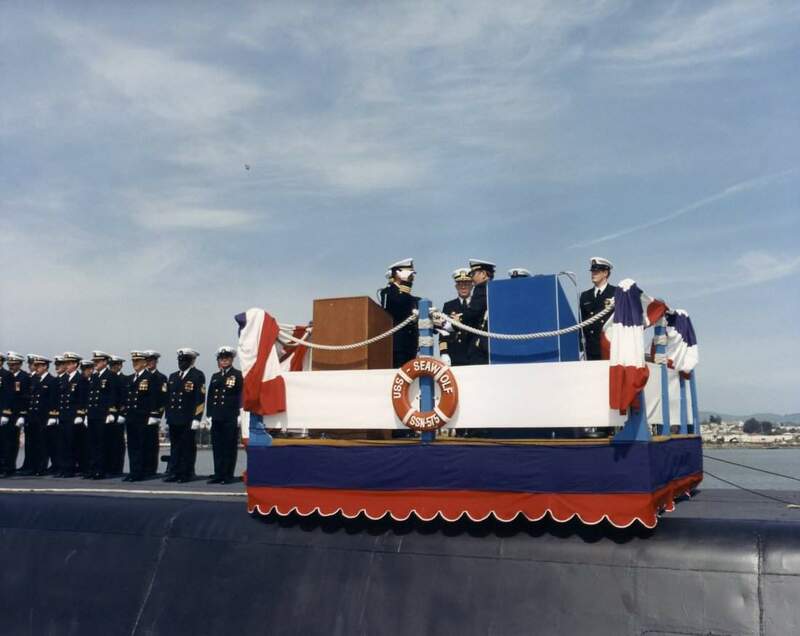 63k The commissioning penant is presented to CDR R. W. Talipsky at the decommissioning ceremonies of the Seawolf (SSN-575) at Mare Island on 30 March 1987. USN photo # 219990-3-87, courtesy of Darry L. Baker. 110k Retired Capt. 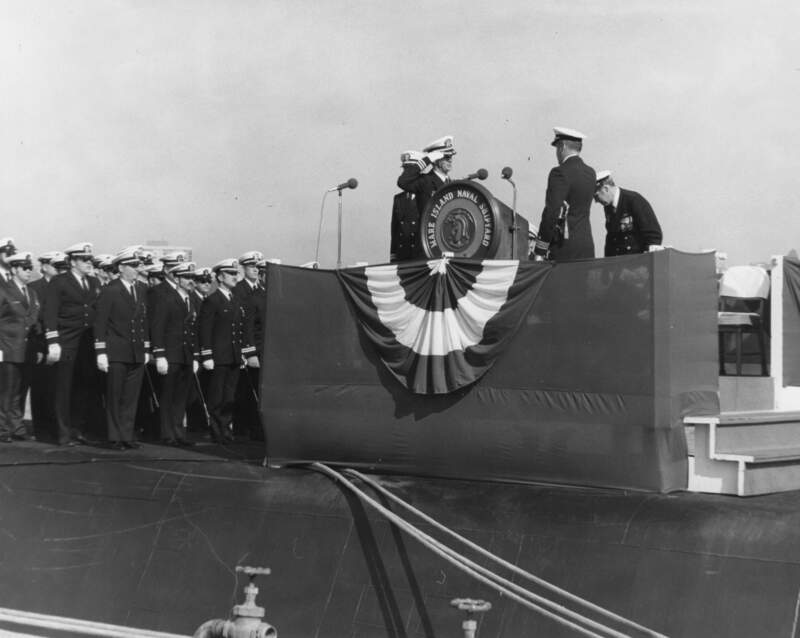 R. B. Laning [first commanding officer] of Seawolf (SSN-575) followed by CDR R. W. Talipsky [last commanding officer] of Seawolf depart at the conclusion of the boat's decommissioning. USN photo # 219994-3-87, courtesy of Darry L. Baker. 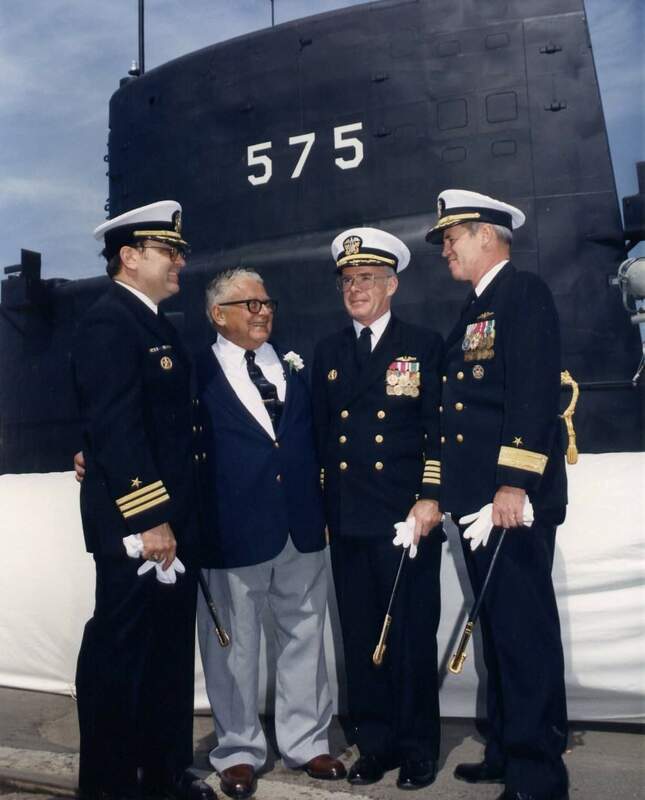 82k Group photo from left to right CDR R. W. Talipsky (last commanding officer of Seawolf (SSN-575)), Retired Capt. 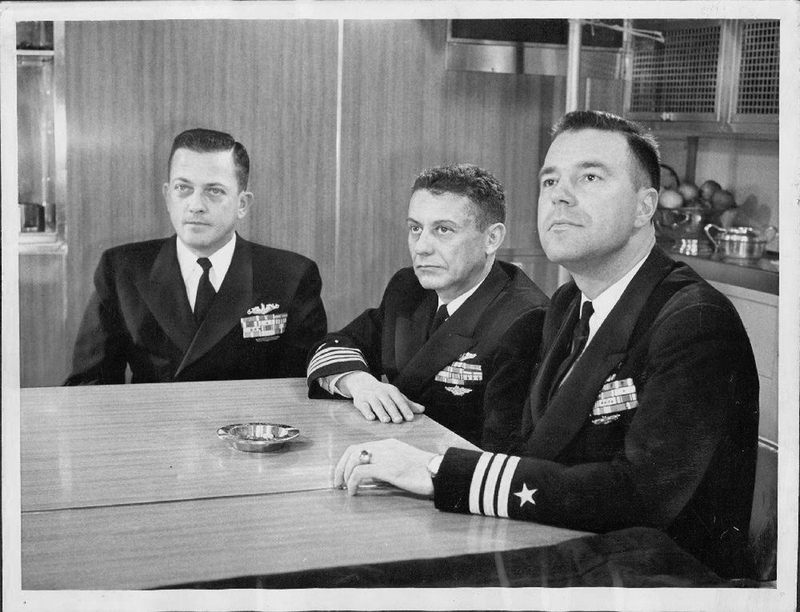 R. B. Laning (first commanding officer of Seawolf), Capt. M. C. Tiernan (COMSUBDEV GROUP ONE), and RADM R. W. West, Jr. (COMSUBPAC) at the conclusion of the boat's decommissioning. USN photo # 219995-3-87, courtesy of Darry L. Baker. 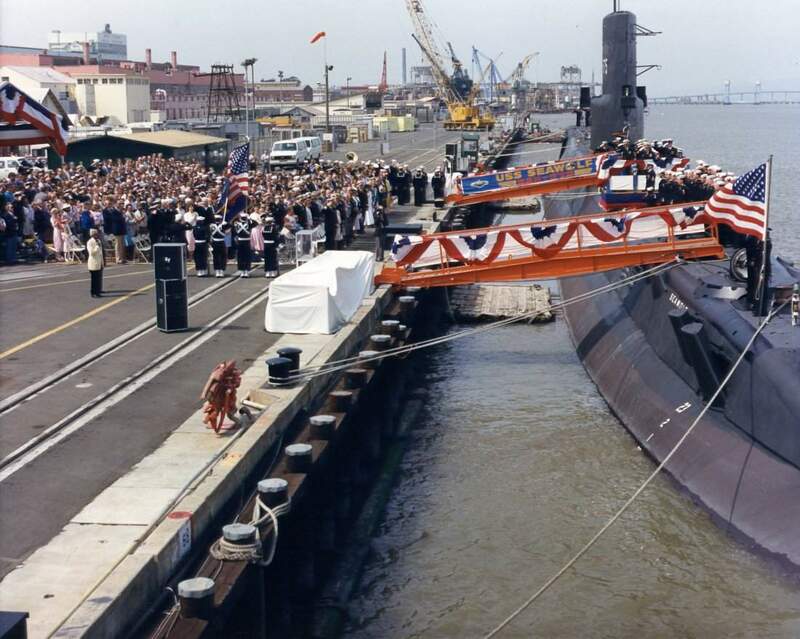 125k Bow view of Seawolf (SSN-575)) during her decommissioning ceremonies at Mare Island on 30 March 1987. USN photo # 219999-3-87, courtesy of Darry L. Baker. 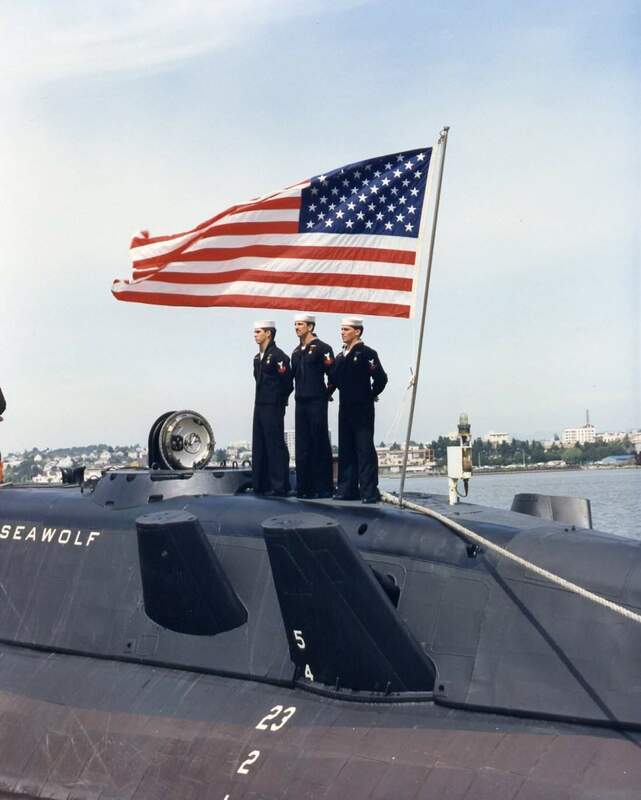 97k The ensign flies aboard the Seawolf (SSN-575)) for the last time during her decommissioning ceremonies at Mare Island on 30 March 1987. USN photo # 219999-3-87, courtesy of Darry L. Baker. 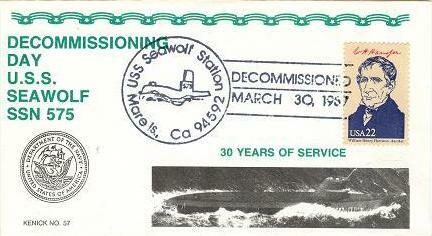 26k Commemorative post card marking the Seawolf's (SSN-575), decommissioning, 30 March 1987. Courtesy of Richard Leonhardt. 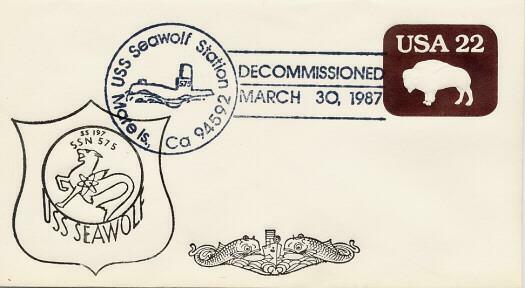 27k Commemorative post card & photo inset marking the decommissioning of the Seawolf (SSN-575), at Mare Island, CA., 30 March 1987. Courtesy of Jack Treutle (of blessed memory). 275k The Seawolf (SSN-575) is seen under going an inclining experiment at Mare Island Naval Shipyard in April of 1987. She is undergoing inactivation at the time. Note large navigational lights on the sail which were required for her towing. USN photo # MSA 220036-4-87, courtesy of Darry L. Baker. 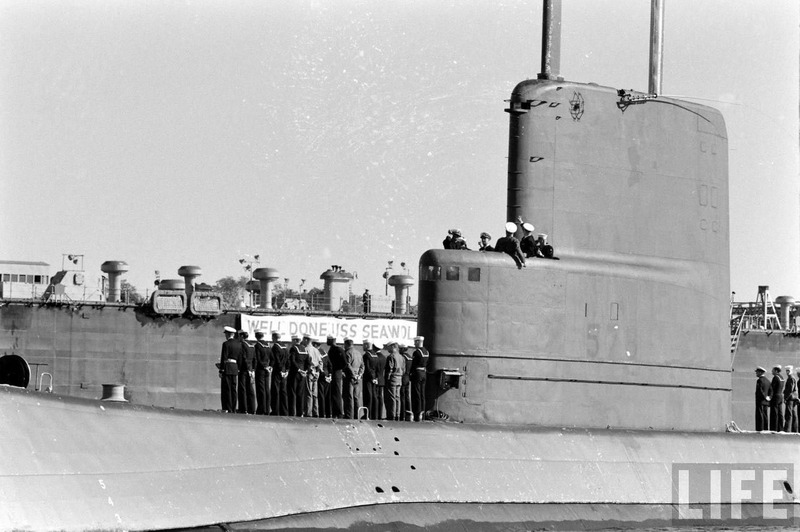 202k Flag still flying, the Seawolf (SSN-575) is at MINSY being prepared for decommissioningand subsequent towing up to PSNS, late April 1987. USN photo courtesy of John Parrott, ex-MM1/ss, USS Seawolf SSN-575, 1983-Decomm Crew. 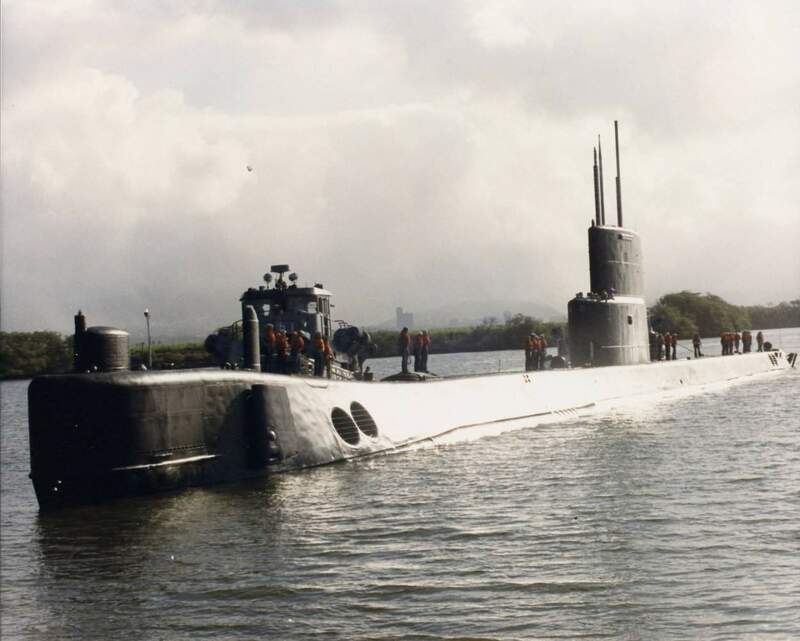 180k Broadside view of the Seawolf (SSN-575) at MINSY being prepared for decommissioningand subsequent towing up to PSNS, late April 1987. USN photo courtesy of John Parrott, ex-MM1/ss, USS Seawolf SSN-575, 1983-Decomm Crew. 683k An aerial view of a section of the Ship Intermediate Maintenance Facility at Puget Sound Naval Shipyard on 17 May 1993. 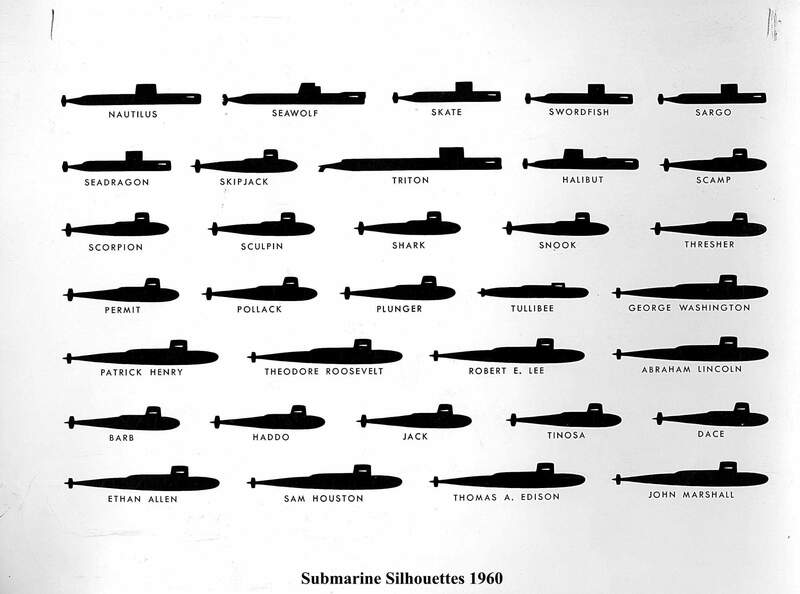 One submarine tender and 16 decommissioned nuclear-powered submarines are shown including the Seawolf (SSN-575); six George Washington, and Ben Franklin class SSBN's (with their missile sections cut out) plus several Skate, Skipjack, Permit and Sturgeon class SSN's. All are awaiting scrapping. 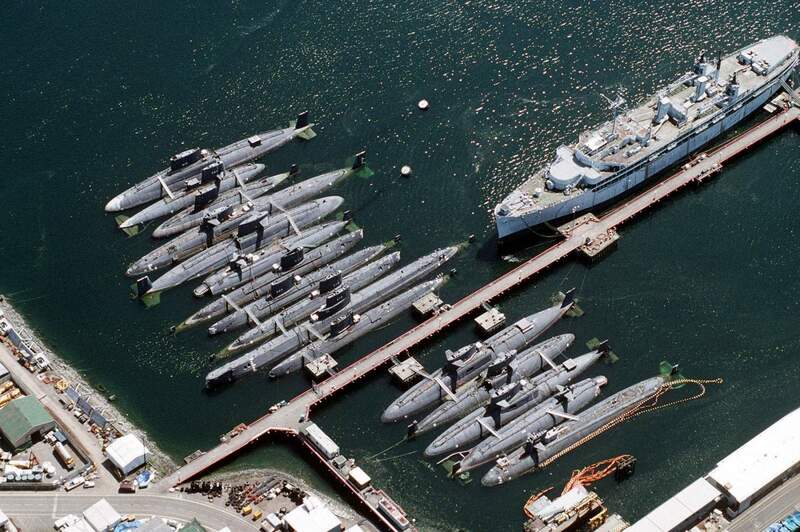 Identifiable boats are, from left to right:Thomas A. Edison (SSBN-610),Skipjack (SS-585), unidentifiable, Triton (SSRN-586), possibly the Benjamin Franklin (SSBN-640), unidentifiable, Skate (SSN-578), Sargo (SSN-583), Swordfish (SSN-579), Seawolf (SSN-575) & unidentifiable. 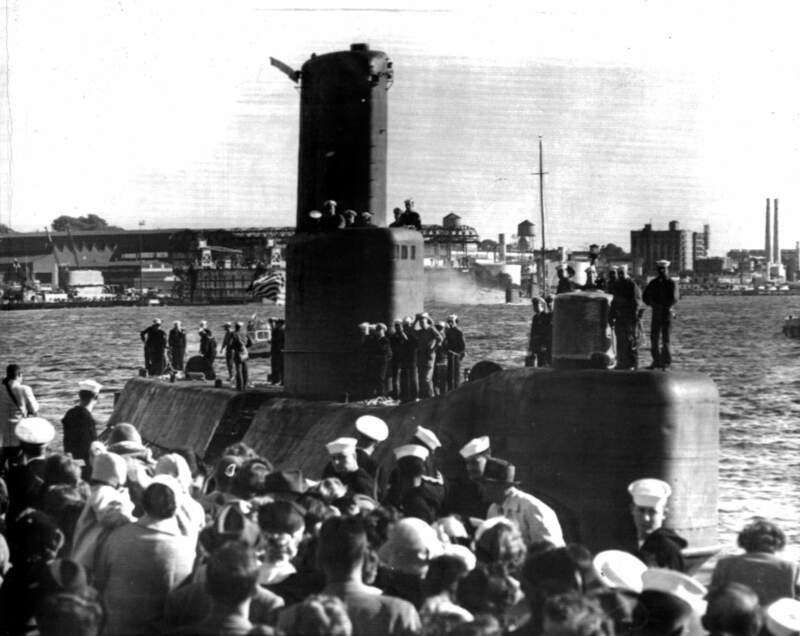 Behind them is the Sperry (AS-12). Across the pier is what appears to be the Thomas Jefferson (SSBN-618), Patrick Henry (SSBN-599), George Washington (SSBN-598),unidentifiable, & maybe the Barb (SSN-596). Official USN photo # DN-ST-95-01863, by Calvin Larsen, from the Department of Defense Still Media Collection, courtesy of dodmedia.osd.mil. 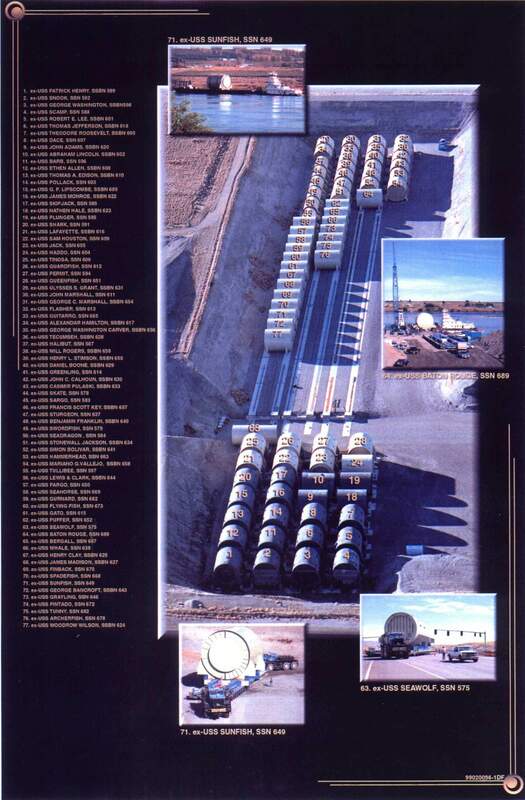 25k Commemorative post card marking the scrapping of the Seawolf (SSN-575), Snook (SSN-592), Patrick Henry (SSBN-599), Henry Clay (SSBN-625) and Baton Rouge (SSN-689), 31 August 1997 at Puget Sound Naval Shipyard, Bremerton, WA. Courtesy of Jack Treutle (of blessed memory).